Flutter, Ionic, React Native or Xamarin? What you use and why? Hey @moumni - I think that like most subjective questions, we need to start with the simple answer which is "It depends". It depends on what you are trying to achieve, what your resources/budget are, and what your current background/skillset is. It also depends on whether you are looking at this from a learning perspective or from an immediate-production perspective. From a maturity perspective I would argue that Ionic has been around the longest, while Flutter is relatively new, and React Native finds the middle ground. So if you are looking at legacy projects or for folks with broad expertise in the space, Ionic and React Native are both good candidates. If however you are looking at long-term futures, I can see Flutter becoming competitive. At the very least, playing with it right now will give you early insights into the platform and a bigger chance to get engaged in contributing to the development and community around it. 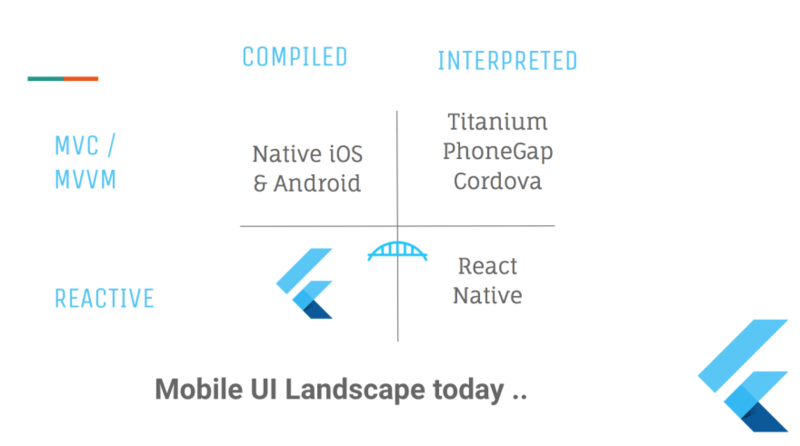 From a support perspective (as in who's backing this) my $0.02 is that the odds favor React Native and Flutter simply because they are backed by the big guys (React Native from Facebook, and Flutter from Google) both of which have vested interests in the mobile apps and experiences market (e.g., the advertising moneymakers are mobile) and are investing time and resources in advocating for their development. 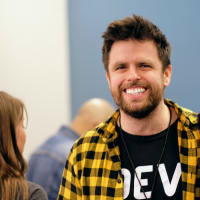 While I haven't played with React Native recently, I did spent all of Google I/O attending the Flutter talks and sessions --- and when you see them treating Flutter as an equal to Android, iOS and web (e.g., in implementing Material Design widgets, supporting Firebase client libraries etc.) you tend to take that more seriously. Ionic on the other hand has a huge following amongst web developers -- but is essentially not as deep-pocketed as the other two. 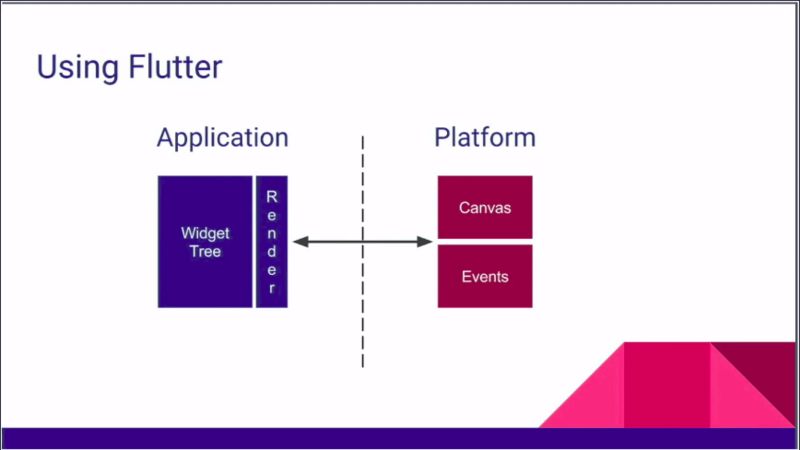 I recently did a lightning talk on Flutter (shameless plug I know) and had this slide which is adapted from one that is used in many Flutter talks. It might give you another frame of reference to compare the three. I have not used Ionic myself but believe it relies on Cordova to create the native mapping. So in this grid, it would in the "Interpreted and non-Reactive" square. It is still a Beta 3 release. They call it production ready but I know agencies and companies that don't consider it viable until it hits at least v1 and has a few more large-scale signature app deployments. It still has a lot of "to-dos" - check out the growing list of issues. Since it is still a small team at Google, this will take some time; the upside is that there is a hugely engaged community and the Flutter team is super responsive to ideas and contributions. There is more to say but hopefully this gives you a starting point for the discussion. Note however that after being in this industry for over two decades, I no longer believe in "winners vs. losers" -- rather I think its important to be pragmatic and adaptable, and pick the technologies that suit your immediate needs best, even while you learn things that are on the horizon. I remain a fan of all three and their engineering teams. A friend of mine recently got into Flutter and liked it a lot, although his main concern was the lack of clear "conventions" (as he said it : "it's awesome but it's hard to find out what's the best way of doing something"), what are your thoughts on this ? Yes, absolutely. I am actually going to answer this in two parts. First, Flutter is still in beta (currently beta release 3 I believe). I am guessing that the Flutter team is racing to complete a number of issues that need to be addressed (e.g., in terms of missing widgets or libraries, enhancing or providing key features like accessibility and internationalization, tackling performance targets etc.). And since they are a fairly small team, that means that things like documentation and best practices may not be as comprehensive as they should be. That said, I have been seeing an incredible number of resources popping up -- from a full-set of new codelabs to a free Udacity course to a growing list of YouTube Videos and Shows from Flutter team developer advocates. If I had to guess, I would say that developer evangelism is a huge item on their list and that we will start seeing a lot more content/guidance coming out over the months leading up to the official v1.0 release. Second, Conventions are often the byproduct of usage, and we need more usage. What I mean is that people who write the middleware, libraries, APIs and platforms may not always know how those get used by developers. Conventions are often driven by best practices derived from widespread usage -- and in that sense, my hope is that we will see more conventions defined later in 2018 because organic usage of Flutter is trending upwards. My best advice for right now (and in fact, this is what I do and plan to do more of) is to sift through the open-source examples to understand how various things are being implemented, and learn by duplicating and then customizing those for your needs. The awesome-flutter repo is a wonderful source for open-source community apps as well. That said, I will leave you with two observations. First on coding conventions. I do think the Flutter team has done a great job with providing a built in formatter that automatically reformats code to align with specific code conventions. If you work with distributed teams, or if you share code with others, having an objective formatter is great because it results in code that looks familiar and consistent to everyone (even if your inner control-freak is incensed by their indentation count). Second, on design conventions. 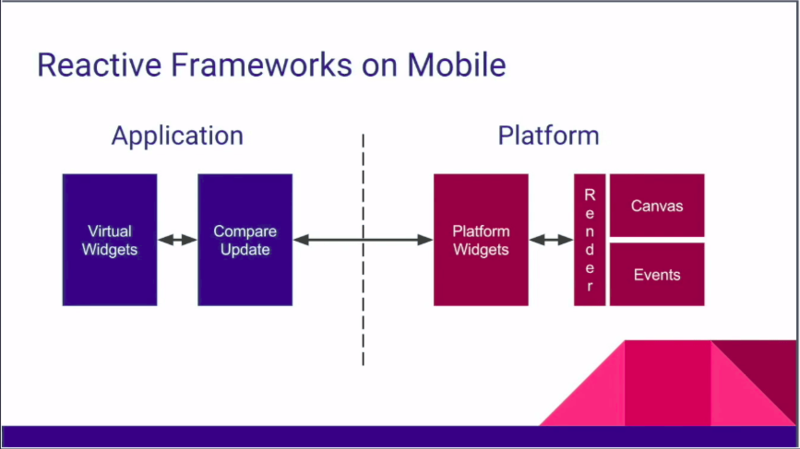 I think this is what you are interested in and the challenge I foresee is that Flutter is aiming to be a universal app framework that appeals to web, Android, iOS and other mobile platform developers. And each of those domains/developers comes with some baggage on design conventions established within those domains -- that now have to either translate into this realm, or be overcome and new ones learnt to be productive. And that may be the most interesting and valuable thing that comes out of organic community contributions to this discussion -- ways in which we can unify our thinking around this new platform by bringing best practices from environments we are familiar with, while understanding the strengths & weaknesses of this one. Awesome answer, it definitely helps, I'll forward this to my friend ! I would love to use Flutter but the problem is its base of the language dart. It's great if you like/ know Java but I'm a JS guy, why Google I thought your a JS fan like me man. The Flutter team didn't chose Dart because it just likes Dart. This is all great, infact I am convinced to learn dart instead of ionic but is there a way to incorporate soket.io are some like that (packages)? I've looked at all 3 and I (still) use Xamarin. Of the 3 Xamarin is the closest to the respective native platforms and it supports more platforms than the others. Xamarin allows me to still be a native developer using the same native API's and UI (storyboards and android xml layouts, without having to learn a new user interface framework. C#, the top 5 languages in terms of popularity is very productive. Together with .NET you have a powerful combination, espeically if you're crafting your own backends too using .NET core which is also cross-platform. Now you can share common classes (esp json POCOs) between App and Backend code. Xamarin allows be to keep abreast of whats new in the respective native frameworks. I think Flutter is promising, but dart is a very niche language, and its too early to bet on it being a winner. Flutter 🤠, although I am a JS developer for more than 9 yrs, Flutter is faster, simpler, overall better (or at least will be once it reaches a more mature level). try it, I heard it is like a drug, you cannot stop using it after you get the hot-reload taste. I'm used to create-react-native-app and Expo, so this is something I already have. but I mean for a small project, what is the best cross platform between this to code faster? I don't know much about Ionic or Flutter, just that Ionic got voted to be a rather bad framework in the Stackoverflow developer survey. Also, RN was created because frameworks like Ionic have bad performance. When things like React-Native-DOM get traction, RN will also add a reliable way to make Web apps with one code-base. On the other hand I only heard good about Flutter, the only thing that keeps me from it is Dart, hehe. Ionic wasn't mentioned at all in the last SO survey. If you're referring to Cordova, it was on both the most dreaded and most loved, so maybe there's a correlation. Ah okay, I had the impression Ionic was always used with Cordova. I think React Native is the most "mainstream" which has some benefits. Dart is a fresh take which certainly can learn from RN issues and attracts folks who don't like coding in JS (which might be a more "advanced" crowd). I don't know much about the Ionic tech or community but it strikes me as a pretty good tool which hasn't always found the consistent "why you should use this" message. Ionic's pitch as always been pretty simple: want to use standard web development tools/technology/libraries for mobile (and PWA/Desktop)? Ionic is a great fit. I personally favour RN. Because it's JS and React. I'm in India and talking to some of my friends. Surprisingly many of them favour Angular and Ionic because of its maturity . Ionic's getting a lot of attention and upgrades in recent days . Surprisingly people don't know about flutter that much, atleast in my circle. Xamarian only a handful no of experts prefers it. answers from the Flutter team. issues we've found have not been related to flutter. in-depth analysis I recommend this article by Wm Leler. haha @nitya i bet you have feelings on this one! OMG where do I start? One of these days my opinions will get me in trouble but here goes..
No :D It was amazing! React Native has more chance of looking and working like a native application. Flutter has more chance of meeting the performance requirements of a native application. Flutter gains performance both avoiding the overhead of this intermediary layer and also (in production/release mode) by running compiled code (hence Dart). Neither is likely to ever be as good as writing a native application, but both have the potential to be good enough. I haven't used Flutter, Ionic or React Native, but I found myself pretty comfortable with Xamarin. I've been using it at work for a fairly big project and I didn't have many issues regarding it. It also definitely improved over time since I've started working with it (about 4 years ago). All that I've said is mostly related to Xamarin native (Xamarin.iOS and Xamarin.Android), as I didn't touch Xamarin.Forms for a couple of years. Even though it's an amazing tool for prototyping, it really becomes a mess when one wants to customise more the UI, and then it becomes a mess. 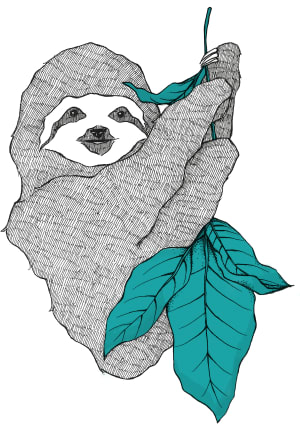 Besides, it's considerably slower than the native ones. The speculation was on the future of React Native. There’s a rumor React Native was abandoned in the main Facebook app. Anyone heard similar/different? Sources close to the matter have confirmed they’re moving away. It was instantly debunked from a Facebook/React authority. @sandofsky This is not true. @sandofsky Blood Donations, Crisis Response, Privacy Shortcuts, Access Your Information, Wellness Checks are recent projects in the main app mentioned in F8 keynote that use RN. (The whole Oculus Go mobile app as well.) More to come. RN hasn’t been used yet in News Feed but that may change. If you are coming from a Web Dev backgorunf I will highly suggest you to go for ionic. With ionic 4 coming the performance has increased a lot and also with the introduction of StencilJs the performance will be near to native. Flutter has been gaining a lot more traction and even just browsing YouTube I am seeing videos of using Flutter create something a lot more. I looked at it when it was still even newer and did a couple things with it. I liked how it tended to do things. I picked up dart in no time. Seems like a good language. I am also a C# developer. I see a lot of different influences from other languages in it. To me a big thing to consider on frameworks is how easy it is to setup and get going. I got flutter up and going when I had never used it or Dart before in 10 minutes and had their hello world app going. I followed the steps for React Native on Windows and had constant issues. Left a bad taste in my mouth. That might be unfair but I am a huge fan of a framework being really simple to setup and get going. It scares me away when something just doesn't work when following official documentation (I think a lot of JS based frameworks and libraries suffer from this). Flutter is still a developing ecosystem. Even though it is backed by Google there is no great community(its growing, but not complete). For example I wanted to build a book reader for Mobile. (I don't use ionic so...) React Native is the obvious solution. Companies or agencies with experienced developers or someone who can write everything from scratch, Flutter is your optimal solution. Because its performance is awesome(compared to react-native). For Beginners React-Native or Ionic and Xamarin for C# devs. I would choose Vue-native or Xamarin, depending on the app, since those align well with my normal web-based work. But honestly, I’m putting my long-term cards on PWAs. When will Artificial Intelligence replace frontend developers? Now, I'm thinking is there anything that can't be done by JS?